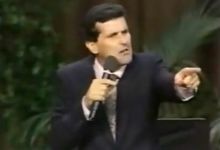 Peter Popoff is a fake healer, not a faith healer. He has been around for decades, fleecing hundreds of thousands, taking in millions of dollars annually, zeroing in on the most vulnerable, or should I say, gullible. Beware of this false prophet! He's only after one thing, your money!